Pneumatic cold fogging unit, portable. The Turbo ULV is a portable, electrically operated pneumatic cold fogger. 50 l/s (free blowing). 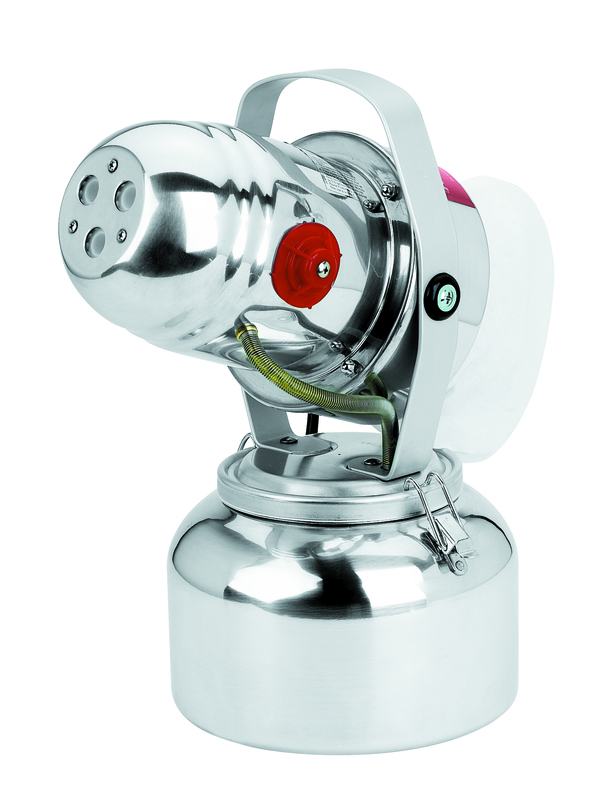 The liquid is atomised into a fi ne aerosol, which is adjustable from approx. 10 to 100 μm dependent on nozzle size used. The precise flow regulation is provided by means of interchangeable nozzles. Nozzles and fogging conduits withstand weaker acids and bases with pH-value 5-9. The popular Flex-A-Lite fogger has a wide range of options. 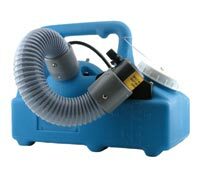 This fogger is useful for applying disinfectants, deodorizers and chemicals used for coating the insides of heat ducts or other surfaces. of this size remain suspended in air for extended periods of time. Droplet size will increase as the liquid flow rate is increased and will average approximately 80 microns when the liquid flow is adjusted for maximum output. Larger droplets are dispersed by air flow and can settle on surfaces. The time-proven Fogmaster Tri-Jet® 6208 fogger serves the needs of a wide range of uses for both indoor and outdoor application. Disaster restoration, food plants, hotels, barns, parks and hospitals are just a few examples of areas which depend on the Fogmaster Tri-Jet for effective treatment. The portable 6208 is a "cold fogger" - it handles both water - and oil-based solutions - and has a one-turn control knob to adjust particle size and degree of misting. The dispensing rate is easy to calibrate in the field to compensate for differences in liquid density or viscosity. 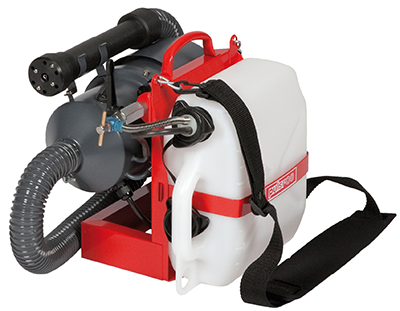 The Tri-Jet fogging head can be adjusted at up or down angles as required. Made of durable aluminum, it's lightweight, but tough enough to justify its five-year limited warranty. More uses than ever ... another effective solution from Fogmaster.